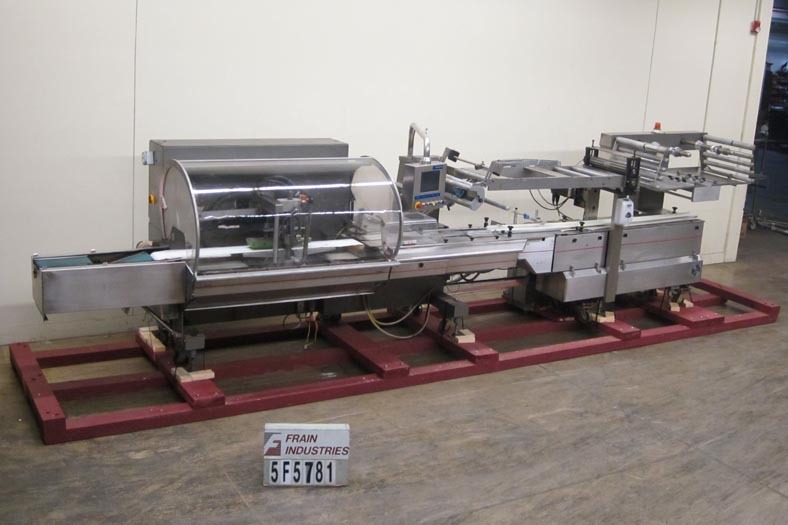 Rose Forgrove Model Integra 602, automatic, servo driven, horizontal wrapper, rated from 60 to 150 packages per minute – depending on materials and application. Package size range: 3.35" to 23.6" in Length x up to 10" in Width x up to 5.90" in Height. Equipped with stainless steel contact parts, all servo controls, 2 product in feed conveyors, into lugged feed conveyor set on 12" centers, dual film arbors with splice station, film registration, bottom fin seal wheels, 1-up, 11" Long x 1- 1/4" Thick serrated hot knife box motion cross cut seal jaw with flip up, shut off safety guarding. A/B servo controls has swing arm touch pad controller with panelview, statis light bar, e-stop buttons. Film spec’s: Maximum of 17-3/4" reel width, 19" diameter and 3" OD core. Mounted on steel it base frame with casters. Rose Forgrove Model Integra 602, automatic, servo driven, horizontal wrapper, rated from 60 to 150 packages per minute – depending on materials and application. Package size range: 3.35" to 23.6" in Length x up to 10" in Width x up to 5.90" in Height. Equipped with stainless steel contact parts, all servo controls, 2 product in feed conveyors, into lugged feed conveyor set on 12" centers, dual film arbors with splice station, film registration, bottom fin seal wheels has a water cooled long seam dead plate, 1-up, 11" Long x 1-1/4" Thick serrated hot knife box motion cross cut seal jaw with flip up, shut off safety guarding. A/B servo controls has swing arm touch pad controller with panelview, statis light bar, e-stop buttons. Film spec’s: Maximum of 17-3/4" reel width, 19" diameter and 3" OD core. Mounted on steel it base frame with casters.